Thanks so much for all of the support in my last post! 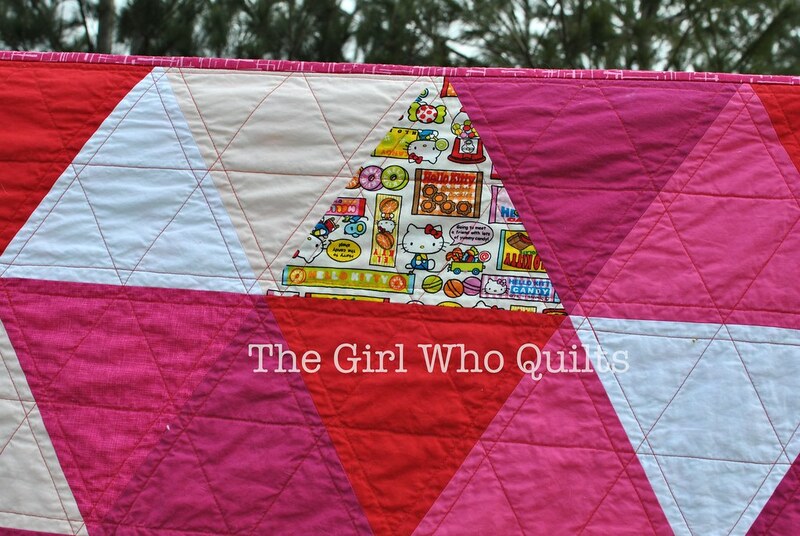 I really, truly wasn't digging for compliments, nor was I trying to bash the Modern Quilt Guild. I simply wanted to share my quilt and how I was feeling! 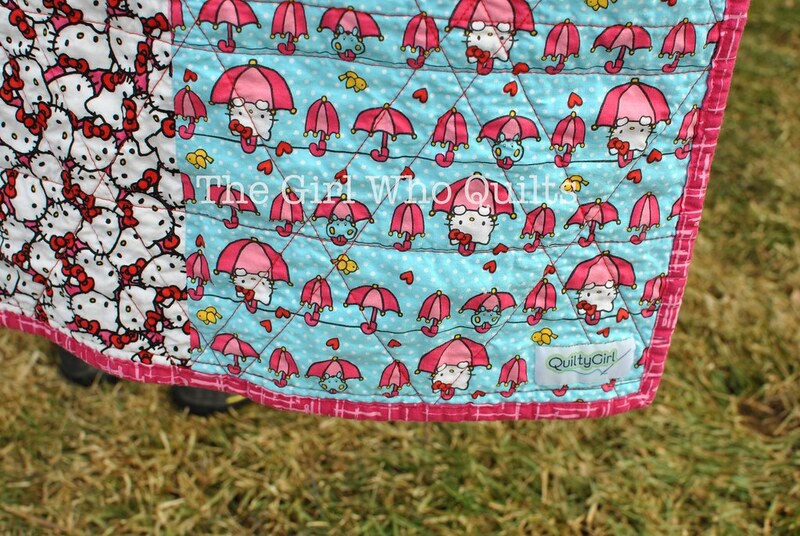 I don't know if I shared this in my last post, but when I first received the feedback on my quilts I was pretty hurt and upset. It honestly did not occur to me that others had received similar feedback and were feeling the same way. Reading about others' experiences really helped me, and I'm glad that they shared their stories as well! Now, onto something more cheerful! I made this quilt for Addy for Valentine's Day this year. I was in a bit of a time crunch with a few customer orders plus Matt's quilt to finish, so I didn't start this quilt until the night before Valentine's Day!! Luck for me our family has a tradition of sharing gifts in the evening on special occasions, so I worked long into the night and nearly had the quilt finished before Addy got home from school. I did have to hide in my bathroom to hand stitch the binding corners and add the quilt label, though! 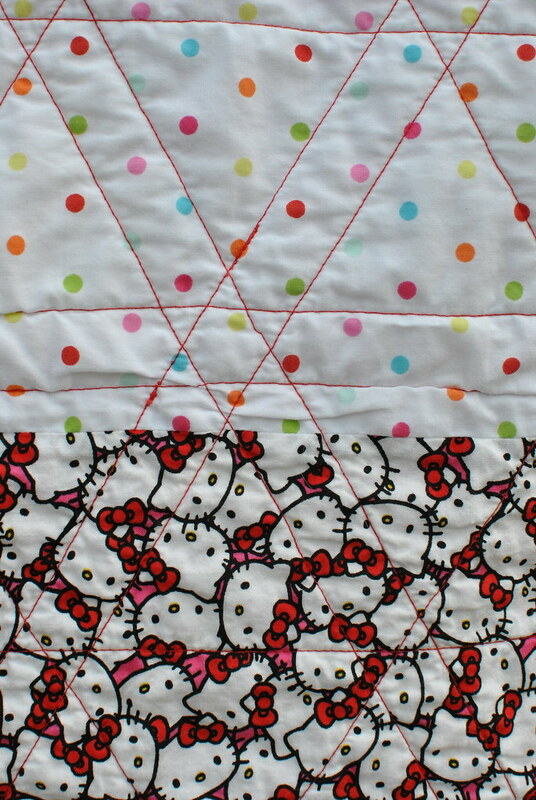 I started this quilt with 8 11" squares of different Hello Kitty prints that I bought from an Etsy seller in Japan. I initially chose several different solids to use, and even cut the triangles. But after some late night texting with my friend Steph we decided that the colors weren't working at all. In the end I went with all reds, pinks, and white with a cross-weave thrown into the mix. It helps that pink is Addy's favorite color! I went with straight line quilting, and I really like how it turned out! It did take a bit longer than I expected though, because my initial thought was to simply follow the piecing lines. 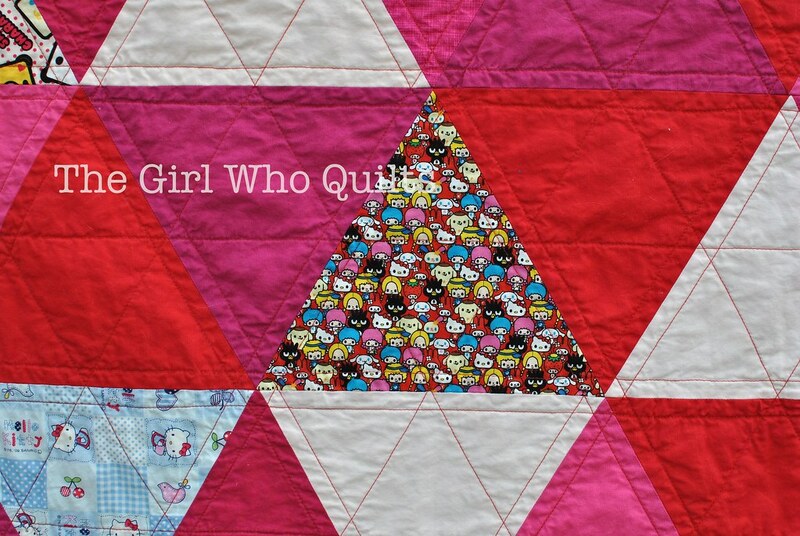 I didn't think that was enough quilting, though, so quilted through the centers of the triangles as well! I'm glad that I did, because I really like the look now! I want to share one last photo, but first I'll explain. 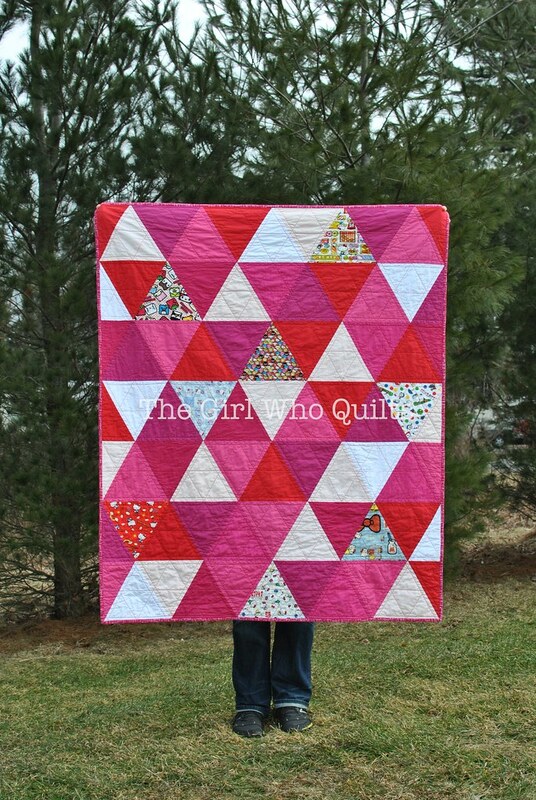 I've been quilting for 11 years now. I'm pretty type A, and I try to take great care in every step of the quilt making process. For some strange reason I *love* to baste - I pin baste, on my little kitchen floor! 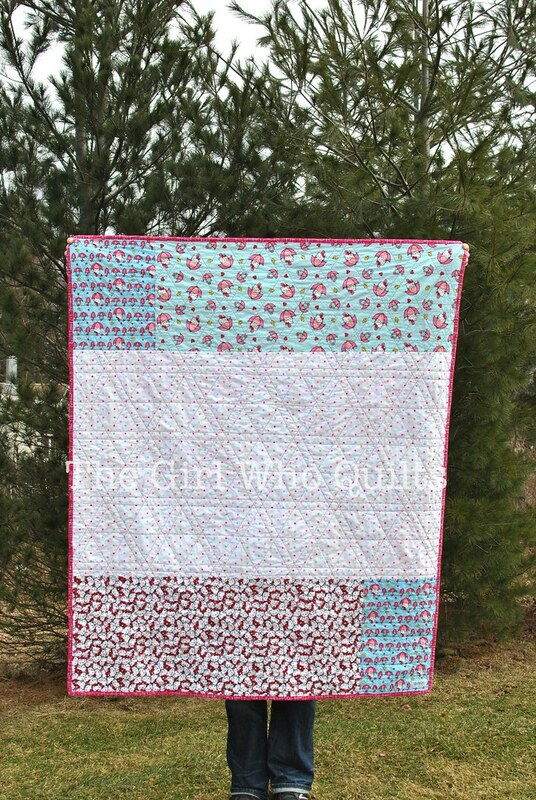 For this quilt, I used bamboo blend batting, which is really soft and has a delicate drape. I've used this batting before and didn't think anything of it. However, I ended up with several folds in my backing after quilting all of those straight lines (this photo is just a sampling, there were a few more!)! All of the folds involved the polka dot fabric, which came from a thrifted bed sheet. I'm assuming that the bed sheet was made up of a polyester blend, so I *think* that it may have been the smooth batting + the poly blend sheet that caused the shifting. I honestly think I could count on one hand how many times this has happened to me! I tried not to beat myself up about it, though....these things happen to even the most careful crafters, and Addy loves it just the same.